prop the tablets up in many various ways, depending on location and situation. 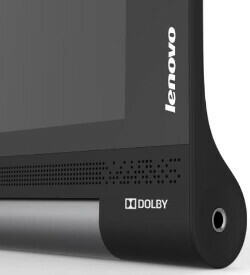 Additionally, each of the devices packs a set of stereo speakers on its front, powered by Dolby Atmos 3D Surround Sound tech. The tablets also have a single 8 MP camera, perched atop a rotatable module, so that it can act as both a front-facing and back-facing snapper. 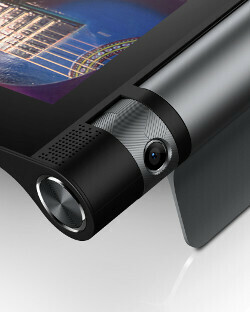 Lenovo has also equipped the slates with what it calls AnyPen Technology – it allows any metal (or conductive material-made) object to be used as a stylus, should the need call for it. Both devices run on Android 5.1 Lollipop and their hardware is quite modest. The YOGA Tab 3 8" is equipped with an 8" IPS display with a 800 x 1280 resolution (~189 PPI), a quad-core, 1.3 GHz processor by Qualcomm, 1 GB of RAM, and 16 GB of internal storage, expandable via microSD of up to 128 GB. The lights are kept on by a 6,200 mAh battery. The YOGA Tab 3 10” sports a 10.1” HD display with the same 800 x 1280 resolution (~149 PPI) and is also equipped with a 1.3 GHz, quad-core Qualcomm SoC, and 1 GB of RAM. Its internal storage is also 16 GB, expandable via microSD up to 128 GB, and its battery is larger, at 8,400 mAh capacity. As far as pricing goes, the Wi-Fi only variant of the YOGA Tab 3 8” will start at $169, whereas the LTE-capable one will start from $199. The 10” model will cost from $199 for the Wi-Fi only version, and from $249 for the LTE-capable one. the display resolution is a disappointment. For 199, 10 inch tablet isn't bad.